This is one of those meals that is perfect for the upcoming cold weekend. All the ingredients were placed in the Slow Cooker in the evening before we went to bed. It slow-cooked all night and we made some delicious sandwiches for lunch. The brisket was so flavorful and tender! Note: If you don’t have a Slow Cooker see conversion to oven cooking below. Lay brisket on a flat surface. In a small bowl, combine the paprika, brown sugar, onion powder, garlic powder, chipotle chili powder and salt. Season both sides of brisket with paprika mixture. Place the brisket in the bottom of the Slow Roaster; cutting in half if needed. Peel onions and slice in thin rings. In a medium bowl, combine the ketchup, brown sugar, red wine vinegar & Worcestershire sauce; mix well. Place the onion rings on top of the brisket and pour the barbecue sauce over both the onions and brisket. Place the lid on the Slow Cooker and turn the heat onto Low Setting – cook for 10-12 hours; High Setting for 5-6 hours. Alternately, you can heat your oven to 325 degrees and place brisket in an oven safe dish; placing onions and barbecue sauce over brisket. Cover and roast 3 hours. Remove brisket and slice across the grain; place sliced brisket in a deep platter and add scoops of cooked onions and sauce. 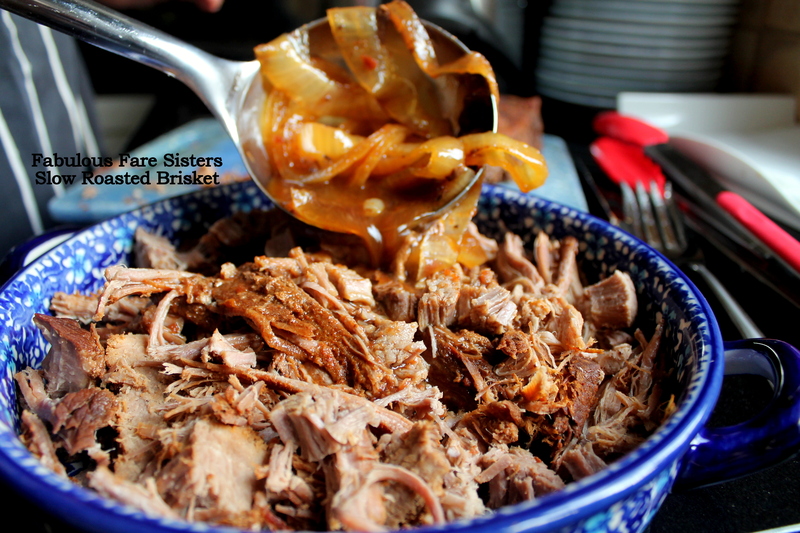 Now that the brisket is cooked you can serve it several ways! You can serve it along with rice or potatoes and a veggie or you can make sandwiches – which is what we did! 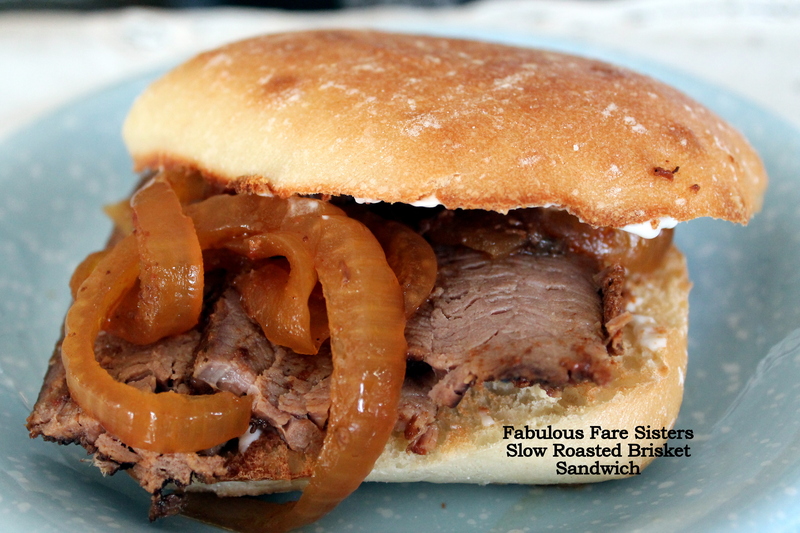 To assemble the sandwiches: using a nice and crusty roll, slather on a little mayonnaise, layer brisket, onions and top with barbecue sauce….so yummy! We ate this for two days in a row and wished we had more…Enjoy! This recipe has been shared on Throwback Thursday, Fiesta Friday, and Saucy Saturday. Go check these sites out and see so many wonderful recipes! This looks delish~! I love the little bit of chipotle powder~Thanks for bringing this by Throwback Thursday and Happy New Year~ I’ll be pinning this to our Throwback Thursday board. Husband had fantasies about American brisket. I ordered a piece from a fancy butcher for him But it was a bit pricey. I must try to find a cheaper source so that I can try this recipe for him. That’s true; great for a feeding a big gang and such a crowd-pleaser. It is! 👍🏼 have a great week! I’ve only made brisket once, and killed the poor thing. It said to bake it like forever and to not look in the oven. It looked like coal when I finally opened up the oven. Your brisket looks mouthwatering! i can see what you wanted more! thanks for sharing at FF101! Imagine waking up to that smell…oh. I forgot. You didn’t even have to imagine it! That is a good looking brisket sandwich. Absolutely! Thank you for providing us all with opportunities to share our recipes! 🙂 Happy New Year! Love this hearty and healthy dish! It looks delicious. I want one now and I just ate lunch! That does it! I’m moving in! Will eat mine with rice please…haha. Looks delicious. TFS and have a great weekend. Just like you guys on FB. Doing great.